BACKGROUND AND PURPOSE: The possibility of using MR imaging as a sensitive marker of the structural changes in Parkinson's disease has been a long-sought goal. We describe a new method for imaging and quantifying the morphologic changes of the substantia nigra in Parkinson's disease and compare radiologic findings with clinical evaluation. METHODS: Using a combination of two MR imaging inversion-recovery pulse sequences, the substantia nigra was imaged in six patients with Parkinson's disease and six age-related control participants. A radiologic index was defined and used to quantify the signal changes that were observed in the patients. The radiologic index was compared with clinical scores obtained from the Unified Parkinson's Disease Rating Scale. RESULTS: The images showed loss of signal in a lateral-to-medial gradient in cases of Parkinson's disease, corresponding to the known neuropathologic pattern of degeneration. The radiologic index was highly correlated with the Unified Parkinson's Disease Rating Scale score, and there was no overlap in radiologic indices between the patient and the control groups (P < .00005). CONCLUSION: This study suggests that MR imaging is sensitive to structural changes in even the earliest cases of Parkinson's disease, thereby indicating the potential for detecting presymptomatic disease. Furthermore, a radiologic measure has been defined that correlates with the conventional clinical measure of disease severity. Therefore, MR imaging could prove to be a sensitive biological marker for objective staging of the disease. Parkinson's disease is a common, progressive neurodegenerative condition involving mainly the degeneration of neurons in the substantia nigra pars compacta (SNC). Approximately 10% to 20% of all cases may be familial and inherited in an autosomal dominant pattern with incomplete penetrance (1). There is general consensus that at the onset of symptoms, the majority of neurons in the SNC have degenerated. Although surgical and medical interventions can alleviate the symptoms for many years, they probably do not alter the rate of degeneration. Nevertheless, putative neuroprotective interventions aimed at slowing or even halting disease progression are currently under investigation (2, 3). Therefore, considering the enormous human and socioeconomic costs of Parkinson's disease, the earliest detection, and even the detection of presymptomatic disease, is highly desirable. Furthermore, an objective radiologic measure would be of value for assessing the effects of such interventions in both asymptomatic and symptomatic patients. Clinical staging is the present standard of reference for following disease progression. The most comprehensive and widely used scale is the Unified Parkinson's Disease Rating Scale (4). Despite its strengths, however, the scale has a number of distinct limitations. Patients have symptoms that fluctuate from day to day, and there may be considerable interobserver variability. These sources of error alone require that clinical trials of drug efficacy must include a large number of participants. Also, by definition, the scale renders one incapable of detecting presymptomatic disease. At the present time, the most sensitive imaging techniques for the detection of Parkinson's disease are positron emission tomography (5–8) and single-photon emission CT (9–11). Both techniques measure striatal changes, but not changes in the SNC itself. Positron emission tomography traditionally measures the uptake of dopa in the striatum, whereas single-photon emission CT uses a tracer, β-CIT, which is a label for dopamine transporters. Both techniques are sensitive to disease stage in symptomatic patients and hold the promise for revealing presymptomatic disease. They are, however, relatively costly and not widely available. Moreover, both techniques require that a patient be off medication for at least 12 hours before the study. This can be uncomfortable for a patient with advanced symptoms, and is potentially dangerous. On the other hand, MR imaging is a simple and relatively inexpensive technique that is widely available. Its use in this context has therefore been a highly desirable but elusive goal. Various efforts have been made to show nigral changes by using MR imaging. These fall essentially into two categories. The first category is based on the changes in T2 and T2* signal associated with the increased iron deposition in the SNC occurring in cases of Parkinson's disease (12–14). Iron is deposited in the SNC in normal aging, however, and this may create difficulties in separating patients from control participants. In particular, in a large study, changes in T2-weighted imaging findings did not correlate either with disease duration or with clinical severity (14). The second category involves measurement of the width of the SNC (15–17) by using T2-weighted images. Although thinning of this structure does occur in cases of Parkinson's disease, the nucleus is only a few millimeters wide and takes on an irregular appearance as the disease progresses. This makes the width difficult to define with precision. We have recently developed a different MR imaging approach for evaluating the SNC, which uses a combination of two pulse sequences, each of the inversion-recovery types, which are therefore heavily T1-weighted. This approach was based on the hypothesis that T1-weighted imaging depends mainly on the intracellular space and that such sequences ought to be sensitive to the changes in intracellular volume occurring with cell death. One sequence was specifically designed to suppress peduncular white matter and the other to suppress nigral gray matter. These image types are white matter–suppressed (WMS) and gray matter–suppressed (GMS). A combination of these pulse sequences showed structural changes in the substantia nigra in even the earliest cases of symptomatic disease. Six patients in various stages of the disease (Unified Parkinson's Disease Rating Scale scores, 12−71; age range, 38−70 years; mean age, 58 years) and six age-matched, healthy control participants (age range, 37−72 years; mean age, 56 years) underwent imaging. Informed consent was obtained from patients before imaging was performed. All patients were taking their usual anti-Parkinson's disease medication at the time of the imaging. None of the control participants had any known relatives with Parkinson's disease, and all were examined and questioned by an experienced neurologist to rule out signs and symptoms suggestive of early Parkinson's disease. Imaging was performed using a Siemens 1.5-T Vision system. To avoid head motion artifacts due to respiration, all patients and participants were immobilized in flexion-extension of the neck by means of a chin strap. Imaging of the SNC was performed using two distinct inversion-recovery sequences. The first of these was designed to suppress nigral gray matter, whereas the second was designed to suppress the white matter of the crus cerebri. As previously hypothesized, for patients, the GMS images showed large variations in signal intensity within the SNC. These signal changes were particularly pronounced at the anterior and lateral edges, making the boundaries of this structure difficult to define in patients with advanced disease. On the other hand, signal variation in the WMS images was less than but in a direction opposite that of the GMS images. In WMS images, the edges of the SNC were distinct, even in patients with advanced disease. Therefore, by taking the ratio of the two images (WMS/GMS), not only is contrast improved (because the signal changes are additive) but the borders of the SNC are defined, even in advanced cases. For each pixel in the ratio image, a signal intensity ratio is defined as its value in the WMS image divided by its value in the GMS image. WMS images were obtained with an inversion-recovery (modulus) pulse sequence of 1450/20 (TR/TE) with an inversion time of 250 ms. GMS images were obtained with a similar inversion-recovery sequence but with parameters of 2000/20 and an inversion time of 420 ms. The field of view was 200 mm, and the image matrix was 256 × 256. The number of acquisitions was two. The section thickness was 3 mm with a gap of 0.2 mm. Four axial sections were obtained in each case, with sections selected from a sagittal scout image of the brain stem. Sections were chosen to be perpendicular to the longitudinal axis of the mesencephalon. The lowest section was taken just at the level of the most rostral part of the pons. Using the WMS image, it was ascertained that the SNC was visible in each of the four sections. By selecting the middle two sections for analysis, we ensured that there was no contamination by volume averaging. The WMS and GMS axial images were used to extract the mesencephalic peduncular structures. Figure 1 shows the original WMS and GMS images obtained through the midbrain in a control participant. 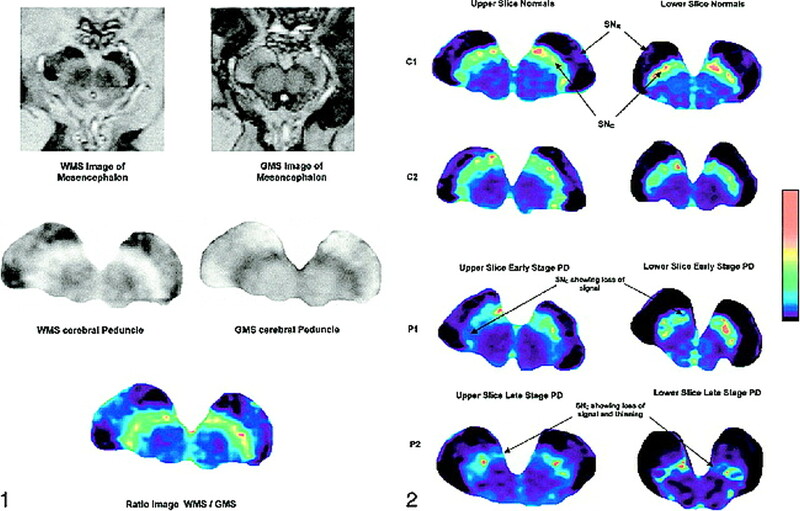 A manual region-of-interest technique applied to the WMS images was used to extract simultaneously the cerebral peduncle in WMS and GMS images from adjacent structures (Fig 1, second row). Note the improved contrast in the cerebral peduncle is because signal intensities in the WMS image are redisplayed in 256 gray levels whereas, on the contrary, the corticospinal tracts correspond to high intensities in the GMS image. The ratio image (WMS/GMS) of the cerebral peduncle was then computed and displayed in color by using a 256-pseudocolor lookup table. Because the eye is more sensitive to color than to gray scale, rendering the images in pseudocolor enhances the structural changes (Fig 2). This is achieved using a 256-level “rainbow” color table, as shown at the side of Figure 2. Figure 2 shows the SNC of two control participants (C1 and C2) and two patients (P1 and P2). Note the presence of the substantia nigra pars reticulata in all cases reaching from the posterior SNC across the crus cerebri toward the edge of the cerebral peduncle. The patient with early-stage Parkinson's disease (P1) shows lateral thinning and loss of signal in the SNC. The lower section of the same patient shows islands of signal loss. Similar areas of signal loss were observed in the SNC of all patients. The last row displays upper and lower sections for a patient with advanced-stage Parkinson's disease (P2). Note particularly the considerable signal loss and thinning of the SNC in the medial segments of the upper section. The lower section shows severe thinning as well as two rims of relatively preserved signal. Two observers evaluated the data. An experienced neurologist, blinded to the computation of the radiologic index, scored each patient by using the Unified Parkinson's Disease Rating Scale (2). The second observer, blinded to the identity of each participant, evaluated the radiologic indices for all participants. No interobserver reliability assessment was performed. Figure 3 shows that there is no overlap between patients and control participants and that the two groups are distinct (P < .00005, Student's t test). 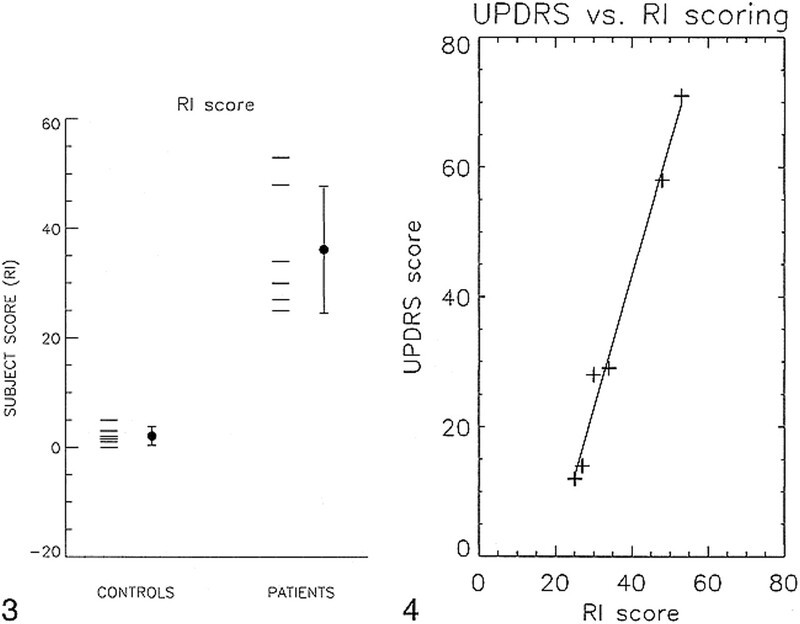 Figure 4 shows a high correlation between radiologic index and Unified Parkinson's Disease Rating Scale score in the patient group (r = 0.99). The neuroimaging of the substantia nigra in Parkinson's disease by conventional MR imaging techniques has been a desirable but elusive goal. Potential benefits include the detection of presymptomatic disease as well as the staging of disease. Detection of presymptomatic disease, especially in the inherited disorder, would allow the early introduction of neuroprotective treatments in those determined to be at risk. Furthermore, the potential for staging the disease might allow assessment of neuroprotective interventions in both presymptomatic and symptomatic patients (19). Techniques of this kind may also serve to differentiate idiopathic Parkinson's disease from other forms of parkinsonism. Visual inspection of the images confirms that the SNC degenerates from lateral to medial and in an anterior-to-posterior direction. In addition, we note that in all six patients, there were zones of signal loss surrounded by rings of relative preservation in the lower section. These were not seen in any of the control participants. The significance of this particular pattern has yet to be ascertained and corroborated with neuropathologic findings. The sharp delineation of these structures, however, shows that the overall changes observed in the patient group were not the result of motion artifact. Artifacts of this kind tend to blur and degrade small structural changes. The distinct separation of the patient from the control group in Figure 3 suggests the possibility of detecting presymptomatic disease. (Note that despite the relatively small number of participants in this study, the two groups were distinct at a high level of significance, P < .00005). Figure 4 suggests the possibility of staging disease progression with a radiologic index. The correlation between the Unified Parkinson's Disease Rating Scale score and the radiologic index is encouraging, although surprisingly high and probably somewhat fortuitous. As with any clinical scoring system, the Unified Parkinson's Disease Rating Scale values might fluctuate because of the performance of the patient, which can vary from day to day. An imaging technique capable of revealing the severity of the disease has several merits; among other things, it is independent of the physical condition of the patient and of the drugs used to control the symptoms. A combination of two inversion-recovery sequences has been used to image in vivo the SNC in healthy participants and in patients with Parkinson's disease. Lateral-to-medial neurodegeneration was confirmed visually in all six patients and allowed for definition of a simple radiologic index to score the severity of the disease. The radiologic index was found to be highly sensitive to even the earliest stages of disease and correlated strongly with the standardized clinical (Unified Parkinson's Disease Rating Scale) score in symptomatic patients. This suggests that MR imaging may not only have the potential for detecting presymptomatic disease but might also be used as a sensitive biological marker for disease progression in both presymptomatic and symptomatic patients. Such a marker could prove invaluable in the assessment of putative neuroprotective therapies. More work is needed to refine the technique, in particular the use of faster pulse sequences and thinner sections. This study was funded in part by the Myra Fox and Max Smedresman funds for research into Parkinson's disease. ↵1 Address reprint requests to Michael Hutchinson, MD, PhD, Department of Neurology, New York University School of Medicine, 550 First Avenue, New York NY 10016.